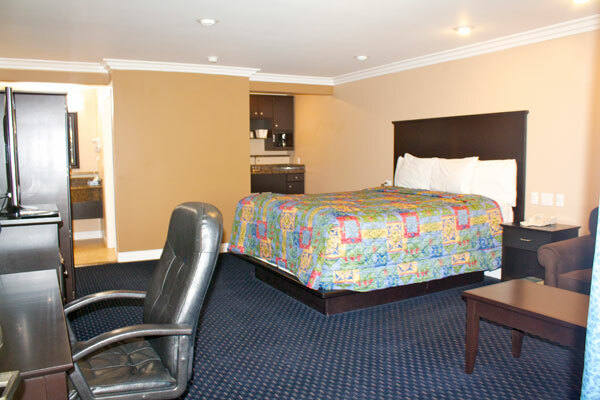 Garden Inn and Suites Glendora CA, Hotel in Glendora CA, Glendora California Hotel. 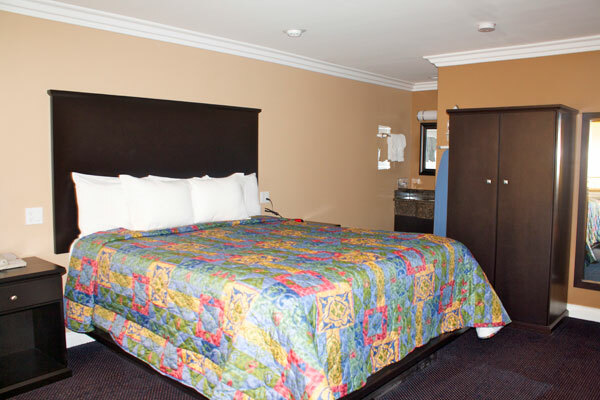 Welcome to Garden Inn and Suites, a hotel made for you in Glendora, California. Whether it's business or pleasure that brings you to the area, we're here for you. We're pleased to be located just 30 miles from Disneyland and just 7 miles from Raging Waters. Our unique hotel has the look and feel of a garden-like adobe oasis, and we offers excellent comfort and privacy since we have just 38 rooms. We hope you'll book early so you don't miss the chance to stay with us in affordable comfort. In-room amenities that will enhance your stay at our Glendora, California hotel include modern LCD televisions, mini-fridges, microwaves, coffee makers, hair dryers, iron with ironing board and more. Plus, we feature free coffee and a free breakfast too. Other nearby attractions include Universal Studios, Monrovia's Restaurant Row and the famed Gibson Amphitheatre. Plus, we're near many local businesses with whom you may be working. Why not book with us now to avoid disappointment? At Garden Inn and Suites in Glendora, CA, we're here for you when you need us. All you have to do is book a room and you'll soon be experiencing the affordable comfort of our excellent hotel – where you're sure to feel at home and wake up to great mornings. Looking for a hotel in Glendora, CA for business travel? We're here for you at Garden Inn and Suites. Our hotel features a continental breakfast, HD television with premium channels as well as other services and amenities designed to rolex replica keep you comfortable when you're with us and give you something great to do in your downtime. When looking for a hotel near Irwindale Race Track, motels near Irwindale Speedway or something close to where you're working, please make us your first choice and you're sure to find us your best choice. If you've traveled in the area before, you know that there are some hotels in the area you should stay away from, but we'll do a great job for you. We're your vacation travel hotel in the area. When you're looking for hotels in Glendora, CA, we're here for you at our clean, convenient, comfortable and affordable Garden Inn and Suites. There are other hotels in Glendora California, and some of rolex replica them might do okay for you. But we're family people ourselves and understand what you need from a vacation hotel. Choose us for the free breakfast, premium HD televisions with cable channels or the great design of our hotel. Keep coming back for the excellent service. You'll be glad you did. Just remember to book early to avoid disappointment. Looking for a comfortable stay at a hotel near the Rose Bowl? Perhaps you're looking for a hotel in Irwindale, CA or a hotel in Pasadena, CA where you can get a great night's sleep and wake up to good mornings. Whatever your need and whatever the reason you're in the area, we're here for you with all the comfort you need and much more at our Glendora, California hotel. We're good enough and nice enough to meet the needs of a variety of travelers, and we want to meet your need for accommodations in this area too. Why not book right away? With only 38 rooms, we often fill up, and we don't want you to be disappointed. Looking for a safe and peaceful stay among hotels on Route 66 in California? What about motels near Pomona Fairplex? We focus on providing comfort, value and service that meets or exceeds expectations, but we also focus on being a safe and peaceful hotel. Our quiet rooms, great security features and conscientious staff mean you can always feel well-protected and well-served when you choose to stay with us. May we be your home away from home in this area on this and all future trips? It would be a true pleasure to be of service to you. Just book right away to ensure you get a great room with a great price. Disneyland could be the world's greatest theme park, and it's just 30 miles from our hotel in Glendora, California. Book now at our hotel in Glendoria, CA and stay just 25 miles from Knotts Berry Farm, one of the oldest and most respected theme parks in the world. Universal Studios is a quick 30 miles from Garden Inn and Suites, and it's an amazing place to explore. You'll need more than a day. Restaurant Row in Monrovia offers a wide array of dining options, and each of them is great. Why not try a different one each night while staying with us? 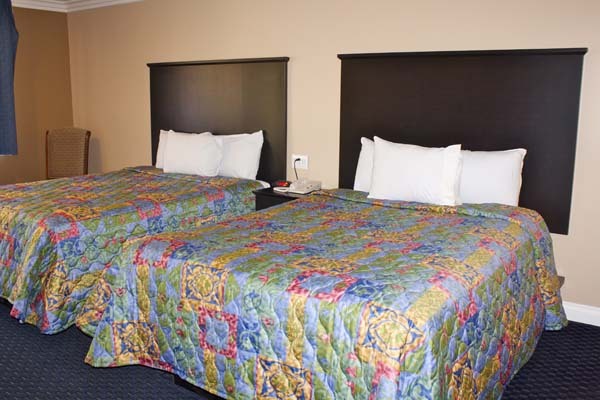 This website is individually owned by Garden Inn and Suites Glendora CA.